Banjarmasin, South Kalimantan (Indonesia) – February 6, 2018 (travelindex) – Best Western Hotels and Resorts has continued its rapid expansion in Indonesia with the launch of an exciting new international hotel in Banjarmasin, the capital of the South Kalimantan province. Now open in the center of the emerging city, Best Western Kindai Hotel is located close to local attractions, offices and government buildings, and is just a 30-minute drive from the city’s Syamsudin Noor International Airport, making it perfect for all types of travelers. 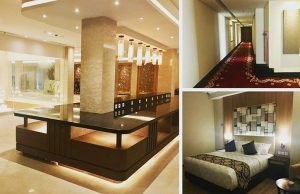 This modern midscale hotel features 106 comfortable, air-conditioned rooms, all of which come fully equipped with facilities, including flat-screen TVs, mini-bars, modern bathrooms, complimentary Wi-Fi and room service. Guests will be able to dine at a variety of restaurants, including an all-day dining outlet that serves sumptuous Indonesian, Asian and international cuisines, and an exquisite Japanese restaurant that is due to open on March 1, 2018. There is also a rooftop Sky Lounge which provides the perfect place to unwind at the end of the day, overlooking the city. The hotel’s four meeting rooms and spacious ballroom are the perfect venues for corporate events and social occasions. Additionally, the hotel’s swimming pool and fitness room are ideal for guests wanting to relax or get a workout in. Nicknamed the “River City”, Banjarmasin is a major commercial, administrative and educational center in Kalimantan, the Indonesian part of Borneo. Guests can explore attractions including the floating market, Batik Village, Siring Martapura River Park and the Martapura Diamond Market, one of Indonesia’s most important centers for diamonds and precious stones, which is just a short distance away. Best Western Kindai Hotel Banjarmasin joins a collection of 16 Best Western-branded hotels and resorts across Indonesia, located in key destinations such as Bali, Jakarta, Surabaya, Solo, Bandung, Batam, Makassar, Medan, Manado and Palu. Best Western Hotels & Resorts headquartered in Phoenix, Arizona, is a privately held hotel brand with a global network of 4,200* hotels in more than 100* countries and territories worldwide. Best Western offers 11 hotel brands to suit the needs of developers and guests in every market: Best Western®, Best Western Plus®, Best Western Premier®, Vib®, GLo®, Executive Residency by Best Western®, BW Premier Collection®, and BW Signature CollectionSM by Best Western; as well as its recently launched franchise offerings: SureStay® Hotel by Best Western, SureStay Plus® Hotel by Best Western and SureStay CollectionSM by Best Western. Now celebrating more than 70 years of hospitality, Best Western provides its hoteliers with global operational, sales and marketing support, and award-winning online and mobile booking capabilities. Best Western continues to set industry records regarding awards and accolades, including 64 percent of the brand’s North American hotels earning a TripAdvisor® Certificate of Excellence award in 2017, Business Travel News® ranking Best Western Plus and Best Western number one in upper-mid-price and mid-price hotel brands, and Best Western receiving seven consecutive Dynatrace® Best of the Web awards for its leading hotel website. Best Western has also won nine consecutive AAA®/CAA® Lodging Partner of the Year awards, recognizing the brand’s commitment to providing exceptional service and great value to AAA/CAA’s nearly 58 million members in the U.S. and Canada. Best Western-branded hotels were top ranked in J.D. Power’s 2017 North America Hotel Guest Satisfaction Index Study – ranking first in breakfast (food and beverage category) for midscale; and second in overall guest satisfaction. Over 32 million travelers are members of the brand’s award-winning loyalty program Best Western Rewards®, one of the few programs in which members earn points that never expire and can be redeemed at any Best Western hotel worldwide. Best Western’s partnerships with AAA/CAA and Harley-Davidson® provide travelers with exciting ways to interact with the brand. Through its partnership with Google® Street View, Best Western is the first major company of its size and scale to launch a virtual reality experience for customers, setting a new industry standard and reinventing how guests view hotels.